MOOSE: It’s great here on iLand island. But we have to find the New Moose! Freddie: Oh, yeah. The New Moose is all about a free and open Internet, not some locked down device! Let’s go to an island where anyone can do anything, just for fun! CAT: Yeah, I’ll show you the way. 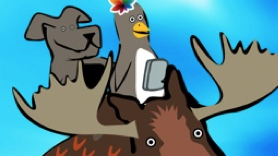 NARRATOR: And so, on the back of the Old Moose, the puppies arrive at LOLCat island. They’re astonished to be greeted by a cat wearing moose antlers! LOLCat: I can be Mooz? NARRATOR: But it soon appeared that some of the LOLCats themselves were trying to close down the open Internet. 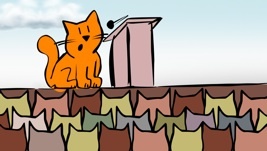 A particularly fat LOLCat is giving a speech to a restless crowd in front of some broken down sheds. Fat Cat: We do all the entertaining, but no one wants to give us any milk! CROWD: LOL LOL LO LO LOL! We have nothing to lose but our copyright. To bring pleasure to you – and whaddya do? Maybe we won’t be so afraid. In all of their nasty nooks . We have nothing to lose but our copyright!